Armchair with 5 way base in polished aluminum, mounted on self-braking castors and fitted with gas mechanism. 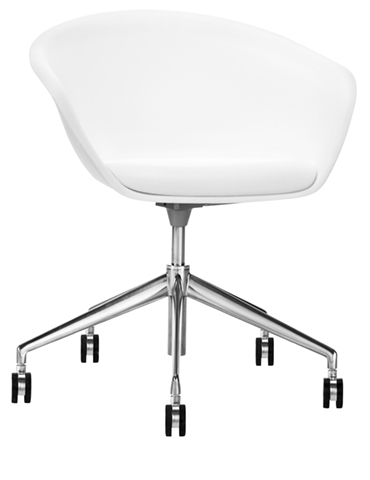 The shell is available in polyethylene, in a wide range of colors or upholstered in leather, faux leather, fabric or customer’s fabric. The Duna shell and base are fabricated in a diverse range of materials, colors and finishes. 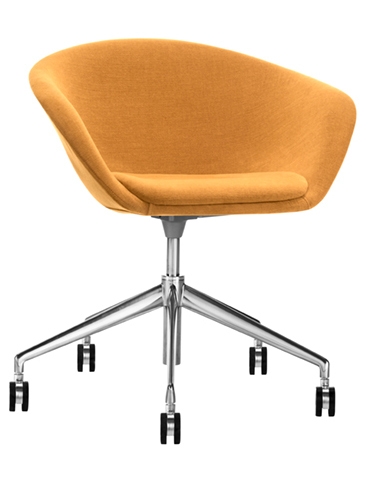 The shell is available in polyethylene in a wide range of colors or covered in leather or fabric, finished with a polyurethane or upholstered cushion. The base comes in chrome-finish or powder coated steel, satin-finish stainless steel, aluminum or powder-coated aluminum, and is available in the following base configurations: sled, four-leg frame, cantilevered, two variations of pedestal, and five-star base with and without castors. The four-leg base with polyethylene shell is stackable to allow for large-scale use and storage. The four-leg painted base with polyethylene shell, also stackable, is suitable for outdoor use. The Duna Collection is GreenGuard certified.